This is not the first time we’ve faced the Bianconeri in Turin and faced a scandal. It kind of seems like it always happens there. Which we never seem to mind if it plays out for us, in our house or there. But there is also a dangerous and growing conspiracy theory out there that started, actually with those cry baby cheating Inter scumbags (that’s the unbiased technical terminology, the vernacular is much worse.) Then Napoli joined them because there were no territorial discrimination witchhunts available at the time. Most famously, this past week, De Laurentiis accused journalists in the north of being biased (but you know, that’s not territorial discrimination at all,) and a La Gazzetta dello Sport journalist had his car destroyed by Napoli fans. So I’m sure the man who hops onto scooters with random strangers and incites violence must be right. All Juventus ref calls are clearly biased and unmerited and that is why they, with the strongest and most coveted team in Italy, clearly own the referees. It’s a scandal. First of all, the only scandal I saw was that Dybala was completely overlooked for the Academy Awards this year. He was whining and diving and throwing himself around like a possessed rag doll. I think I might actually hate him. Wow, that doesn’t happen often. But the award wouldn’t only go to him for the acting. He was dangerous, as were all of Juve’s attackers. A conservative count put them at 24 shots, with 11 of those on goal. It seemed like more. In fact, it’s incredible that it took until the 30th for Benatia to score. 1-0. 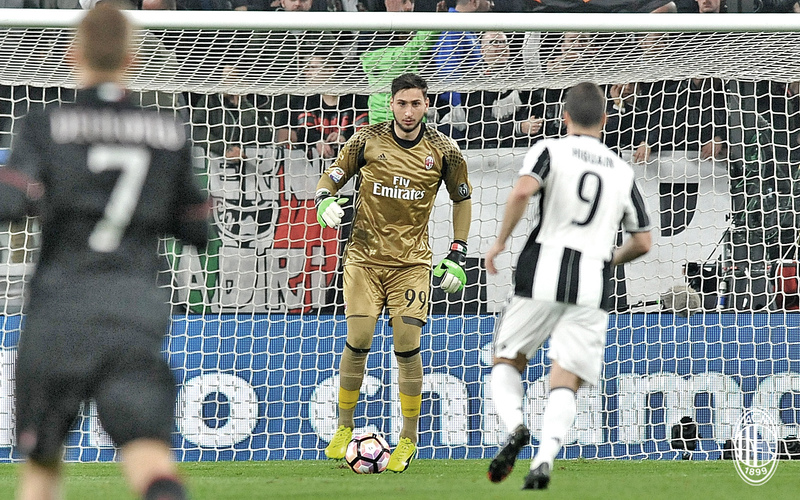 The other scandal is that Donnarumma’s superhuman efforts were not rewarded. Save after save after incredibly impossible save. He was unbelievable. Nine saves in all, but again, it seemed like more. 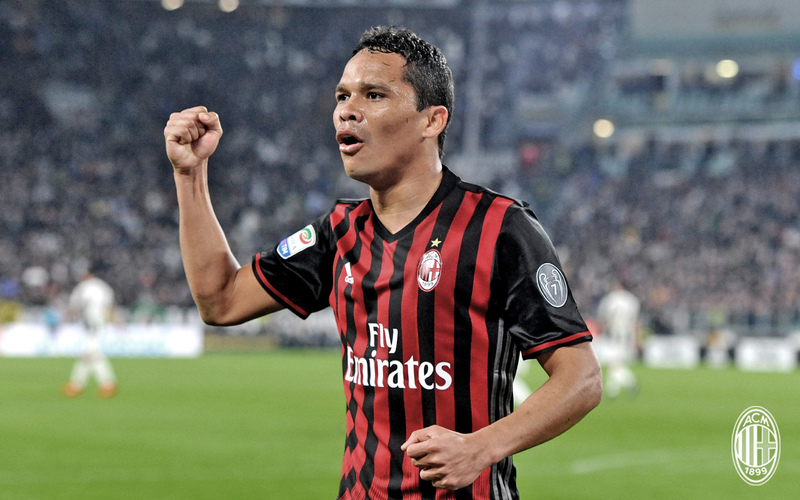 He even helped tip over a wild clearance from Bacca in the 51st that would have definitely been an own goal. Speaking of Baccca, in the 43rd, he took a cross in from Deulofeu, who apparently is so comfortable on the left now that he switched over, and Bacca just hit it home to even things up. I think it was our only shot on target in the first half. We eventually took six shots with a total of two on target. The yellows came, but Massa was prudent with them. Pasalic got one for a foul on Pjanic in the 23rd. Then Deulofeu, seeing his former Barca teammates dive and thrive earlier this week, did his own part to carry the Barca tradition and got carded for it in the 39th. Ocampos’ yellow was really mainly for being clumsy in the 57th. He was kind of in over his head in this game, we really missed Suso. Romagnoli’s was ridiculously stupid in the 61st, he earned his for dissent. And while only the ref report would possibly tell us what he said to the ref to earn it, it’s not his first time on that ride. Sosa did pretty well until the 89th when he was obviously tired and came in late on a tackle. And he made up for a good game by getting himself sent off in stoppage time after a second yellow in the 90th +3. Both he and Romagnoli will be suspended for Genoa. 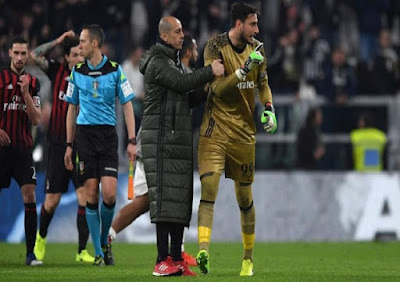 To that end, the man Milan fans are burning in effigy, the villain of all villains, Massa, actually reffed a really good match. Well until the bitter end. And by bitter, I mean if you lost your job, your family, your car, were hit by a bus, attacked by a lion, set on fire, and dropped in a volcano where you were impaled kind of bitter. 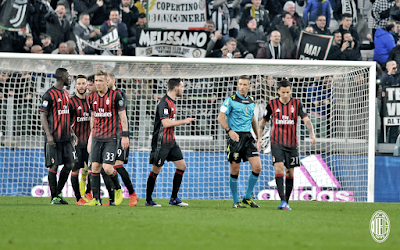 At 94:20, with four minutes of stoppage time, De Sciglio was whistled for a handball and a penalty given to Juventus. This is a crime worse than if the Pope started stealing babies and selling them for hookers and drugs, apparently. Now comes the fun part though. That was the call, then the penalty was taken and converted by that ragdoll diving kid, and then time was up. 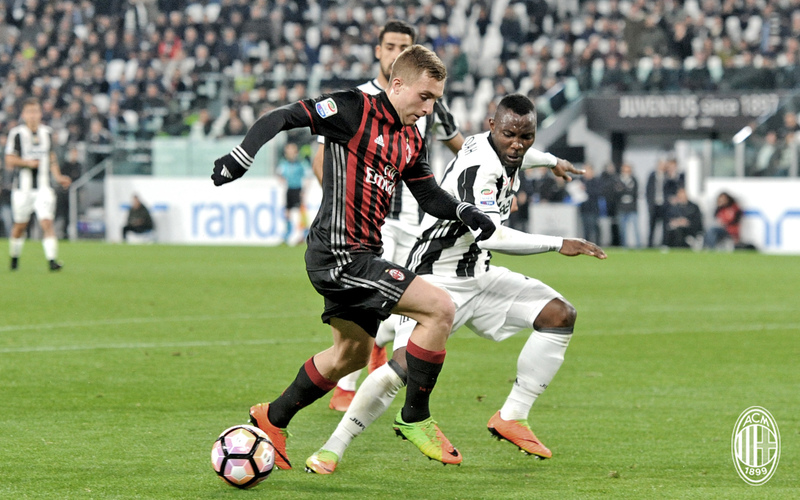 2-1 Juventus. 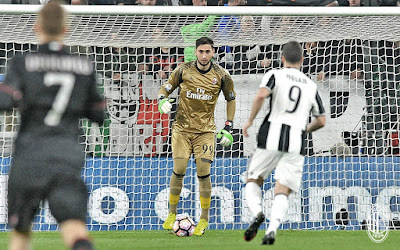 Personally, during all of the shoving and swarming that we typically see from Juventus (but I thought Milan had left behind,) the highlight of the whole match was Donnarumma wisely shielding Dani Alves and forcing him away from the fray. If you were crying too hard or screaming or breaking things or already on Twitter typing conspiracy theories, go back and watch. It was GOLD. The penalty wasn’t the scandal though. The fans were. Sure, we saw Bacca angrily going after the refs, and Montella physically pushing him away. Donnarumma was lip-read to say something that everyone on social media wanted him to say so they could blow it out of context. We saw Galliani on the pitch, probably just dreaming of his next meal at Giannino. Nothing was remotely as scandalous as the fan reaction to this. For entertainment value, there were fans explaining why it wasn’t a penalty, which is standard after a call they don’t like. Some people were telling me that it shouldn’t have been a penalty because it was too tight and De Sciglio could never have moved away from the ball in time. (laughter break) Others trying to argue his hand was or wasn’t in a natural or unnatural position, often saying it backwards like a small child might. (the laughter is a nice reprieve from the pain of the loss, thank you.) More fans jumping on whatever the news outlets were saying. You know those same people who say that Messi is linked with Palermo or something with a straight face? Yes, they lie to us all year round. But when we are angry and hurting and vindictive, they are our CHAMPIONS OF TRUTH. The truth is only Massa and his team can say why they called it a handball. And I’ll let you in on a little secret, VAR would not have solved this controversy. Because within the handball rule is a little word with giant repercussions called “intent.” I always find that amusing because no one can possibly determine someone else’s intent unless they are a mindreader or if all of the players start narrating their every move and wear mics, etc. The replays I’ve seen are all terrible angles, but I noticed that he did try to move his arm back and away, which movement is unfortunately one of the things they train refs to look for to judge intent. It's kind of counterintuitive. It really didn’t seem like a strong case for a handball necessarily, but at the end of the day, Massa did call it after consulting with his linesman (even though media outlets are claiming that Massa called it instead of his linesman,) and if you want to play the game, you have to accept ref calls, no matter how painful. The handball was literally a 50/50 call, as most are. But the scandal is that too many people believe otherwise and are propagating the anger and hate into something that is more hurtful. As for stoppage time… I was going to try to make a little graphic, but you know what? People who can’t sort this out aren’t going to be helped by all of that work, anyway. So let’s begin: This is how stoppage time works. The head ref keeps a special watch on his arm with at least two timers. One is a running clock, the other he stops and starts whenever the ball is not in play, like for injuries or for cards or whatever. At the end of regulation, it shows him the difference. He rounds this to the nearest minute and informs the fourth official. But it is up to his discretion and only he knows the exact time. Once stoppage time is in use, if there is a dead ball, he stops stoppage time. When play restarts, he starts his watch. So for example, in stoppage time at this match there was 8-10 seconds of down time early on, in the 91st minute for a foul or something. Then at 92:16, Sosa was sent off. This whole process took about 40 seconds. Then again at 93:20 for about 30 seconds play was stopped to check an injury or something (I think something happened off camera.) The handball was whistled at 94:20, which was actually well within the initial four added minutes by virtue of rounding. And it took everyone a full two minutes and five seconds until Dybala took his penalty. So either you look at the 3.4 minutes of stoppage time within stoppage time and get that final whistle at 96:25, which is just about perfect. Or you look at the fact that when the handball occurred, the ref was perhaps waiting for an appropriate time that he was able to whistle (due to advantage, etc.) He couldn’t stop the game after an infraction like that, he had to wait for the penalty. Which took until minute 96:25 because the players were swarming he and his linesman and wouldn’t line up. Either way, the stoppage time was managed perfectly. The ignorance, on the other hand, not so much. As for the positioning of Massa and which official called the penalty, that has also gotten blown way out of proportion. First of all, to be completely accurate, the first official always calls the penalty. His assistants communicate to him if they see something that he didn’t, but it's up to the head official whether or not to call it. But if it is true and he called it from behind, his vantage point was definitely poor. However, that doesn’t automatically make it wrong. It happens all the time. And Massa did the right thing to go and consult the linesman, too. That is exactly what refs are trained to do. If you think there is some controversy there, then you are making that controversy up. And the media outlets perpetuating this nonsense and people posting pics of his position are more wrong than any mistake Massa may have made. There is a dangerous mindset that is being perpetuated by fans, social media, the people who claim to be the media, and crazy owners who ride on scooters that this is part of a larger plan. Juventus get calls for and against all the time. All clubs have controversial calls. In the initial leg, we won because a Pjanic goal was incorrectly called back for offside. None of this conspiracy stuff happened, even if we got a lot of lucky calls in the first half of the season, many at San Siro. But if it happens in Juventus Stadium, then people take notice. I mean if it happens there, then clearly Moggi himself is reffing disguised as Massa, while taking bribes, giving out intentionally controversial calls, and doping the Juve squad while they are on the pitch and betting that Juventus will get a penalty call. Wait, some of you might believe that. NO! This is football. There are good moments and poor moments. There has been a rash of poor reffing lately, which happens more the more myopic fans and the media become. Refs make more mistakes as they try to adjust and get it right. But the calls have been exaggerated and reported incorrectly by media and social media, and some good old fashioned hate mixed in to create more extreme controversy. That is the crime. All of you and the media and De Laurentiis and well pretty much everyone who doesn’t support Juventus are creating a false reality where hostility has already turned into actual physical damage in real life. That is not cool. That is not what Maldini would do. I miss when Milan fans had class. Even if you were hurt and angry in the heat of the moment, it is never appropriate to pass along stereotypes and unfounded conspiracy theories. That is the scandal here. Not only will much of this last, because everyone knows what Twitter says is true, right? And what some longtime Milan fan with a bit of objectivity, a lot of football knowledge, and some background in reffing has to say isn’t even on your radar. We live in an age where everyone has become a teenage girl, waiting for the next bit of gossip or controversy and jumping to conclusions. Believe what Twitter spits out 30 seconds after a contentious call rather than think for yourself, maybe watch again, add some perspective and maybe wait for 60 seconds before tweeting. Because doing the first part is easier than facing reality. Juventus are a better team. They had more shots on goal than we had shots total. 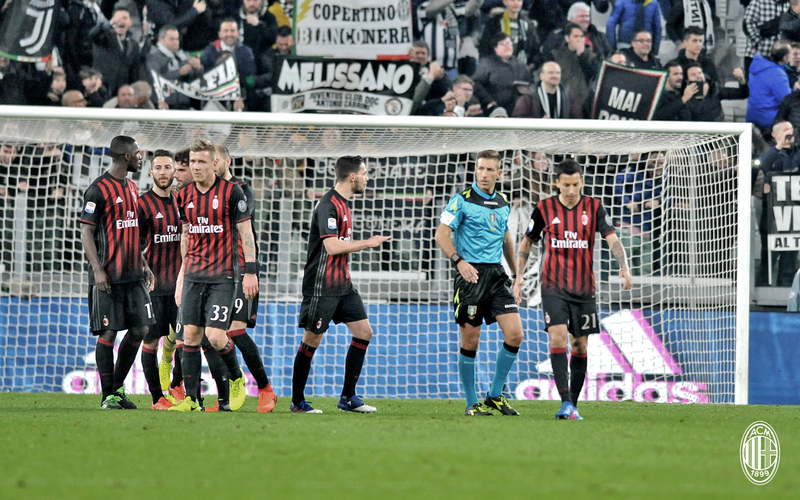 If we had done our job, De Sciglio’s handball controversy wouldn’t have mattered. In the end, it’s football. We didn’t play great, but we defended like crazy for 90+ minutes. Everything else undermines everything our guys gave out there tonight. And the class that used to be associated with this club. And now people’s lives and property are endangered with every single person who buys into this acrimony. 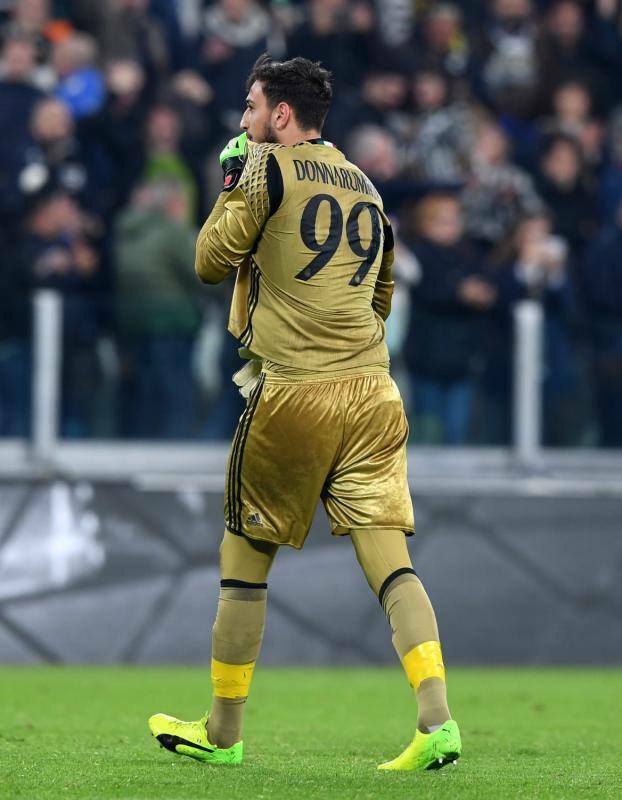 Follow Donnarumma’s lead. He gave it his all. He saw the handball/non-handball just a few feet away from him. And even if he got a little angry, he kept himself under control. And then he did the most spectacular thing: he kissed the crest. Not hate, love. The message to Juve fans was loud and clear: he will never go play there. And that was actually a wonderful thing to come out of this match. But it was done with the class and wisdom of a Baresi or a Maldini. And that is what we all should do in a difficult time like this – not hate or rage or propagate lies and conspiracies – follow the example of our youngest player and simply kiss the crest. This post inspired by the music of Savages's "The Answer"
*Time difference due to Daylight Savings Time change in the U.S.